This Church Street building, with its distinctive buff brick trim, is one of the most attractive in North Gower. The first recorded occupants were Thomas and Margaret Good. Thomas Good was a carriage-maker by trade and possibly used the house as a place of business. The Goods were probably responsible for building the house [c. 1876], and were definitely owners of the land by 1884. In 1901 they sold the house to George Dobson for $1,300 and moved across the street to the old Methodist parsonage, now number 2352. It is reported that the move was necessitated by the ever-increasing number of Good children. Perhaps the Goods had only half a house to live in, though, since at one time the house was split into a duplex and two separate families lived there. 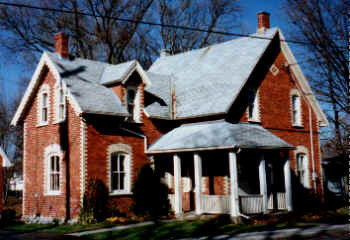 George Dobson kept the house until 1911 when he sold it to George H. [Herb] Moore, who owned a bakery across the road in the old Anglican rectory building. [See 2368 Church Street for something on the old rectory.] Mr. Moore's bakery probably dated from at least 1907, as Mrs. Verda Wright remembers that her uncle, Mr. Ford Pratt, delivered bread for Herb Moore, as a boy, from 1907 to 1914. Moore's bakery burned down in approximately 1920 and took the rest of the old Anglican Rectory with it. In 1935 the house passed from Moore to Walter Harris who sold in 1938 to a different George Dobson, possibly related to the first. This George Dobson died in 1960 and the house then passed to the Carruthers family. In 1966 the Carrigans bought the house from the Carruthers.